Photoshop Design File is a type of Adobe file which is used for designing websites and offers endless variety of filters and tools along with adjusting your pictures to create customized designs for your web page. It is one of the most used business and marketing strategy. PSD files are useful in designing websites which are catering to business and e-commerce. Getting hold a of a trustworthy and trendy PSD Design Services is your one stop solution to conquer the online market. At Tech Support Dubai you will find all the requirements of PSD design for your website. We are a team of skilled designers and professionals who are well versed in the knowledge of PSD designs. Turn your attention to the kinds of services we offer for PSD designing that will make your website’s design to be a masterpiece. Template designs: We are offering an array of templates from the Adobe stock. These can enhance the start up process of your designing. No more boring black and white canvas on the list. Creative Cloud Libraries: With smart techniques, we provide safe storage for maintaining your best assets while you can access them anywhere at anytime. Adobe experience Design : Services for designing and helping protype user experiences for mobile applications and websites. 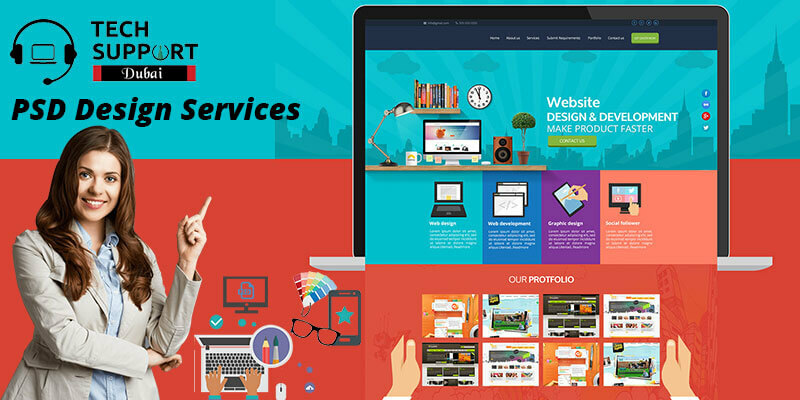 These were some of the services we offer for PSD designing. But, along with these you should also have some knowledge about the threats that you can face if you are going for local vendors for PSD designing. Supposedly, you are completing a beautiful design and your receiver messes it up with a wrong coding usage, all your hardwork will go in vain. Our experts at Tech Support Dubai assure no mistakes at their disposal and deliver the best designs to you. If you have any sort of query regarding PSD designs, trusting on our services will be your best decision. Our team of professionals has in-depth knowledge about web designing. Hence, designing for you is not a different task for us. No other service provider offers you with reliable services for PSD Design services in Dubai like the way we do. We are hardworking when you talk about website designing and we assure you that our service will not be a disappointment for you. Our creative community is well acquainted with Photoshop to deliver perfect results as per your requirement. Have faith in us and we guarantee to offer demand oriented services to make your website look more promising and bright. To get trustworthy and budget friendly solutions for PSD Design company in Dubai you should contact our skilled professionals at Tech Support Dubai. You can buzz us at our helpline number: 042053349 . Furthermore, for more assistance you can avail our live chat portal and get handy solutions online at your desk. Along with this, you can also send us a service request and our executives will address your mail within 24 hours and get back to you.